On our recent trip to St Vincent’s we learned one of the children had died this summer. Her name was Yolande Jean Baptiste. Apparently she had pneumonia and went to the hospital, but was very sick and did not recover. We were shocked and saddened by this news. I guess we all thought that after the earthquake, nothing else bad could happen to our children. We also had the selfish feeling that someone should have told us about it, that somehow we have a special relationship with those children and we deserve to know when one of them is sick or goes to the hospital. We Americans really don’t understand how sickness and death are part of everyday life in Haiti. Although our hearts and minds are at St Vincent’s every day, reality means we are only with them 2 weeks out of every year. Yolande is in many of our photos with her big smile and pretty hair bows. I remember she could not speak but always greeted us with a friendly smile and bright eyes. She was there in Montrouis with the children who were evacuated from the school after the earthquake. Drew sat with her under a tree by the ocean, playing with the “Four Musketeers”‘ Yolande, Yolende, Auguste and Diana. These four children are crippled and confined to a wheelchair. None of them can speak. Auguste is blind and deaf. Yet they love attention and Drew has spent endless hours playing with them, hugging them and holding them in his lap. These children are always together; one of my memories from our April trip is seeing them sleeping together on the floor of a tent, guarded by Madame Merita who is their faithful caregiver. This trip when Drew went to check on them, shortly after our arrival, there was someone missing. Now there are “Three Musketeers”. I wondered to myself if something could have been done to save this child. I have treated several children for pneumonia on previous trips, including baby Diana who was so sick the first time we met her she couldn’t hold her head up off the pillow. Lifesaving antibiotics did their magic, and now Diana is growing up so we have to stop calling her baby Diana. Always there will be this question of what else could be done to help these children. Even in America, children die from pneumonia, but somehow that doesn’t make me feel any better. 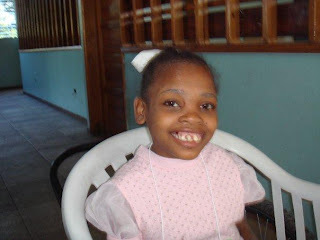 This entry was posted in Haiti Trip November 2010, Stories & Updates. Bookmark the permalink.